Several manufacturers use "RMS" to describe the average amount of power an amplifier can produce. However, this is a misnomer. 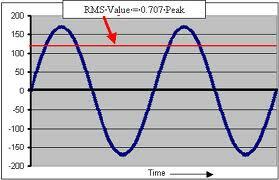 where P is the power in Watts, V rms is the voltage, and R is the resistance or impedance in Ohms. The result is not RMS power! Nevertheless, "RMS" is used by some manufacturers to describe the average amount of power an amplifier can produce. Where this derives from a test, the test actually measures voltage, not power, and the power value given is probably an average derived from the RMS voltage. Many people wrongly believe that the RMS power rating is the same as a continuous power rating. It is not always. For instance, RMS is often used to mean "continuous" power, but because it doesn't really mean that technically, companies that state "RMS" power specs could use short sine wave bursts instead of continuous sine wave tones. Depending on which is used, the real outcomes are quite different. You can measure the RMS voltage of any part of an AC waveform, from many cycles down to a small portion of a single cycle. "RMS" does not imply any particular time duration. When a manufacturer states RMS continuous output power, they are usually saying that the amplifier can produce the rated output continuously into the impedance loads specified. However, as there is no industry spec relating to RMS continuous output power time duration, the RMS continuous power could be for milliseconds, seconds or minutes. It is left to the honor of the manufacturer. It is for the above reasons that IQ prefers to test using the FTC protocol. The FTC power measurement methods are established ways of measuring an amp's maximum continuous average power output. The FTC method is quite strict and rigorous. The attached paper from Stephen Dawson, via the editor of Australian HiFi may be of interest.
" I agree entirely with the argument that RMS watts is meaningless. In fact, we use that term as an extreme shorthand for power in watts calculated from measuring the RMS voltage (RMS is validly used in this context). My reason? It is a proxy measure of quality. It does not always track precisely with overall quality of course (what measure does?) But it still gives important information".